What's wrong with "all you do is just ... "
If you've read this blog at all in the past few months you know that I'm working on a book called Singapore Math Figured Out for Parents, and I do almost all of the math tutoring for Tutoring Colorado, my wife's tutoring business. Lately, too, I've noticed my emotional investment in my life as a math tutor deepens with time. So here's some more about Singapore Math, math tutoring, and math instruction. This one noodles through some ideas that I'm pretty sure I need to put into the book, possibly more diplomatically (so if this angers or offends you, this would be a helpful time to send hate mail). And as I often do, I'm starting off with seven little stories. On break from an English comp class at the College of Last Hopes, I was talking with one of my Adult Disadvantaged Learners about math in general, because she'd been struggling in Pre-algebra. It's the class that the College of Last Hopes offers to students whose math skills are somewhere south of sixth grade. She told me about having had to help her now-adult son with division when he was in fourth grade or so; he was in one of the several curricula where they teach factoring before they teach long division. Since she didn't understand factoring but knew the answer could be gotten by dividing, she taught him the familiar algorithm for long division. He then taught it to several of his classmates, somehow leading to a general parental demand for long division right now. The principal eventually intervened to tell the teacher to skip over that factoring stuff and teach long division since that was what parents wanted. When the kids hit fractions, where factoring is often the quick and easy way, things imploded. Not only was it now necessary to go back and learn factoring (without reference to the fundamental relationship between division and fractions), but in their battle against factoring earlier that year, a large number of kids (and parents, beginning with the one who was now my student) had become convinced that factoring was innately evil and that the cruel teacher was going to force it on them. Fractions ended up deferred till the next year when a more old-fashioned teacher taught it as a set of arbitrary, memorizable rules. Next story is about a much better student. We'll call him Adam, since he's a composite, like every case from tutoring I talk about here; the real kid behind the composite is actually at least three kids. (That adult student in the first story, who was "good at math" without being able to do much of it, was quite real and individual, however. Kids get a pass into anonymity but a grandmother gets to own her folly. Them's, as they quaintly say, the rules). Adam, a pleasant nine-year-old who was recovering quickly from major conceptual math problems, grumbled that now that he could do math, he just wished he was "good at it." This surprised me because once we got him through the block he turned out to be conspicuously talented, with better concentration and work ethic than most kids his age. If I had to pick a tutee who was "good at math" he'd be at the top of the list; nor do I stint on praise with young kids, so it wasn't like he'd never heard that he was doing well before. A little inquiry revealed that "good at math" was what his friends Brian and Claudia were. Both of them were apparently very quick at the algorithms and usually accurate. Now, I know the school those kids attend, and the curriculum they teach there. After months of tutoring, Adam knew a great deal more math, and understood it better, than most of his peers. "Well," I said, sympathizing, and trying to understand why he thought his fellow students were ahead of him, "some people are just lucky enough to remember patterns really well the first time and always get them right afterwards, and they do get right answers very quickly." "They don't get right answers," Adam corrected me. "I get right answers more often than they do." "I thought you said they were good at math and you don't feel like you are." This led to a more detailed account of the peers he envied, establishing that, "They always remember to write the little numbers to the left and above the original numbers, and they cross them out left to right, and they get all the 'neat and complete' points." "But they don't get the right answer?" "Sometimes they forget things or get them backwards like I used to do. I can get the right answer, but Brian always knows how to write everything down so it looks just like in the book. And Claudia knows a bunch of rhymes for how to remember what order to do things in. I wish I was good at math like that." He looked back at the page he had been working on. "I forget. Do I add or times next?" 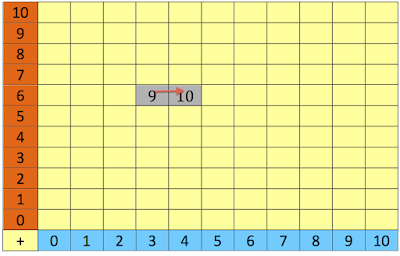 Chances are you were shown the simple versions of rectangle models while you were learning; if your teacher was somewhere in the better half of math teachers, some time was spent explaining what it was about and why you were being shown it. (The less-good half tends to do it because it's in the lesson plan, but doesn't talk as much about why it works or what we can learn from it). It's just the familiar business of "so if the whole box means one, we draw a line through it and each of the smaller boxes is one half. And we write that to show we have one of the pieces we got by cutting it into two parts ... now here's a box cut into three pieces, and we're going to talk about two of the pieces, how do we write that? Yes, 2/3 ..." and so on. And Darcy was pretty much in the same situation as her predecessors going back two hundred years; rectangle models were lifting the fog from fractions. After two sessions of rectangle models practice, she'd reached the point of consistently being able to draw any straightforward fraction problem as a rectangle model. She could then either find the answer directly from the model, or see what operations she needed to do on the fractions. Of course, over time, that second pathway would become the natural one. Eventually Darcy would no longer need to draw the model to think clearly about the problem, or could draw it in her head instantly if she ever needed it. (Rather like the way most people learned the Alphabet Song, and some still occasionally need to sing it to themselves to alphabetize things, but most just know alphabetical order.) 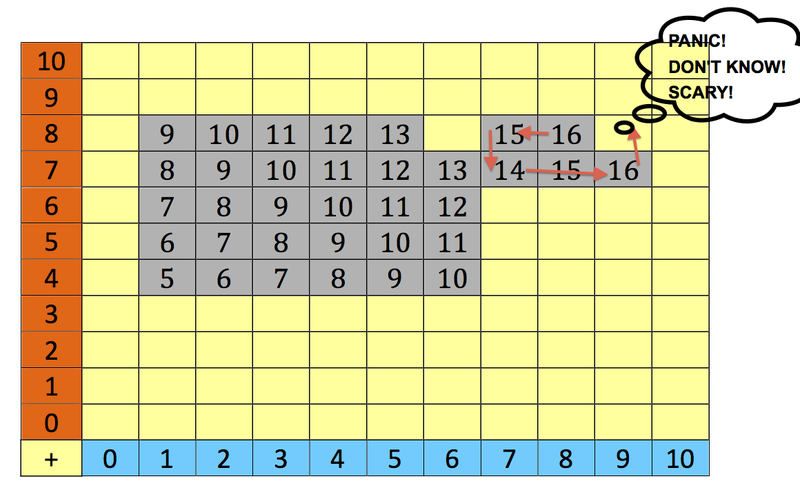 In short or via Short, Darcy eventually learned how the algorithms for fractions worked, and thus she had a clear idea of when to apply which ones, and to recreate or correct any of the algorithms she might temporarily forget. Darcy knows fractions. Now it's just a matter of practicing what she knows until it's easy and automatic for her to do fractions. But today she's very discouraged. "I hate all this thinking. It's a waste of time. I wish you'd just tell me what to write where," she sighs. "Or that they would just give us directions about how to do each problem on tests. I just want to get the answer and go on to the next problem." 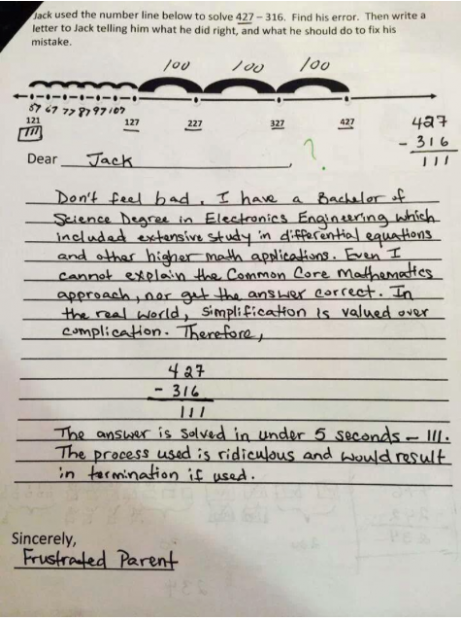 If you worry at all about math teaching in the US -- and I can't imagine you've read this far if you don't -- then no doubt you've seen this bit of second grade homework, which went viral on the Right Wing Kookoo-Bird Web, crossing over to the general web as well. Alas, according to the Stuck Clock Principle, there are places here where the guy is absolutely right. As is usual with things in the Right Wing Kookoo-Bird Web, it's misidentified, facts have been distorted to alarm naive readers, and the actual situation is rather different from what Glenn Beck made of it. Nonetheless, this is not at all an unusual parental response, or an irrational one, and the explanation offered to the parent was not much of an explanation. Furthermore, as you'll find in Sarah Garland's actually-fair-and-balanced article, the homework really is badly designed for its intended purpose, the intended purpose was inappropriate, and it's hardly a surprise that the parent couldn't discern it. What I want to draw your attention to, though, is that in the face of the inexplicable assignment (or, being fair, the assignment that could have been explicated but is still pretty badly done), the first thing a parent does is reach for the good old reliable centuries-old algorithm. And this is a parent who is well-acquainted with and thoroughly grasps math himself (he wouldn't last a day in his job if he didn't). If you do go over there to look over the full story, read the comments, as they illustrate what I'm talking about almost as well as the story itself. Attack: better approach to math? You mean like forcing kids to draw 18 balloons with 5 circles each, then counting them, to reach 90, rather than just letting do the much easier task of memorizing 18*5=90? And riposte: Yes, good example. That way when they reach algebra/geometry/statistics/calculus they already understand how to think conceptually about math. Rather than students who think, "I can't possible memorize this abstract stuff!" you get students who can solve complex problems using the logic they learned solving simple problems. Both sides sort of stabbed past each other here, but I don't think either can be blamed for the way they missed the target; it was pretty dark in there for everyone. To the attack, we might say: The point of having students calculate 18*5 is not that we don't know the answer, or even that they don't. We ask them to do it so that they will learn the math. Knowing the answers is not knowing the math. Knowing the fast way to the answers is knowing a little bit of math. But knowing why that's an answer and what it means -- that's math. And a picture is what is needed for a kid who isn't too sure about what a number is or means yet. You don't need it now, and neither will the kid when s/he's thirty. But conversely, neither of you was born knowing what numbers are or how they work. I have seen more of the memorize-a-long-cookbook approach among the ADLs, who are in a sense a population selected for having difficulty with mathematics, but even there it's scarce. If the problem were just people trying to memorize a complicated cookbook instead of learning math, we could give them all a good shake, tell them what real math is, and have the problem solved before the weekend. Some of the same arguments are played out at a much higher level (for some reason most of the trolls failed to show up, or perhaps were whacked down) is in Leah Libresco's piece in TheAmerican Conservative. Libresco is talking about it from the teacher's perspective, and she's sharp and clear, and several of her fellow teachers, who show up in the comments, also get it and know how it works. The comments also feature some of the most useful kind of commenter for a piece about a hard idea: honest-and-not-stupid people having a hard time seeing what it's about. There are also some trolls and sloganeers, of course. One apparently cannot hold their numbers to zero. But overall, in that piece, people are talking about understanding, and it makes a much better conversation, or at least one less irritating to read. The best way for a kid to get to clarity about a concept is not necessarily the way the kid will do the related problem later as an adult. This is hardly a surprise; it's the way learning a complex skill that you will be using for years often works. Phonics produces more proficient readers, but proficient adult readers rarely sound words out. Many good cooks started out with a well-edited cookbook, measuring everything and following directions exactly, but nowadays they just grab the right ingredients and tools and turn the stove on. A ski instructor friend tells me that the long journey through intermediate from just-qualified-as-intermediate to almost-advanced is mostly moving out of knowing tricks to get down the hill and into just skiing. But it's also quite clear that for many people in that conversation, procedural proficiency is all there is to math. They keep wandering back to "all you do is just..." as a sort of touchstone or mantra, no matter how many earnest and respectful voices tell them that that's not "all", it's not "just" that, and that what you "do" is often beside the point. Older readers have probably seen the "dishonest bellhop" problem, especially because Ripley's Believe It or Not! popularized it decades ago: three men rent a room for $30, and after they've gone up to their room, the desk clerk notices that that room was a $25 room, so he sends the bellhop upstairs with the $5 to give to the men. The bellhop, being dishonest (that's why we named the problem after him), only gives each man $1.00. So now each man has paid $9 for the night, $27 in all, and the bellhop has a $2 unauthorized tip, and that's $29. But they paid $30. Where's the extra dollar? Newer readers may have seen this version of the same problem: You want a shirt that costs $100. You borrow $50 from your mother and $50 from your father. When you get to the store you find the shirt is on sale for $97. So you buy the shirt, return $1 to your father and $1 to your mother, and perhaps because you are secretly a bellhop, pocket that last dollar. So effectively you borrowed $49 per parent, and pocketed one, which adds up to $99. Where's the extra dollar? And fool people they do. Presented as a puzzle to college or high school students, I'd say maybe 1 in 50 who have not seen the trick before will get it. Even more amusing, most students can be shown one of the puzzles, be taken in by it, have it explained, even be able to work the trick themselves ... and will then fall for the other version of the same trick the week after. The trick is irresistible to many of them: there's a procedure and an answer, so you do the procedure and the answer is right. Right? Fundamentally, all these stories show how extraordinarily strong in everybody, but particularly in children, is the tendency to look for a known algorithm with clearly remembered steps to just execute without reference to meaning. Mostly, ordinary people confronted by math want to know what to do, and then do it. Give kids a "what to do" and, as long as they can remember it, they'll do it forever. I strongly suspect that one reason that people understand better if they learn why-before-how is that all they really want to know is "how." If you show them "how" first, they've gotten what they came for, and they'll tune the rest out, no matter how many advantages you can explain to knowing the "why." (And of course, explaining the value of knowing "why" to an eight-year-old isn't always possible; it's not a very "why" age. But as with any ability or skill, if you're ever going to be able to do it at all, you have to start as soon as you can, and long before you're good). This "pull of pattern" shouldn't be a surprise. It is not uncommon in many other situations. You can see it with people who have made hundreds of cakes from mixes but would get nervous about making one from scratch, doodlers who draw the same drawings over and over, and readers who read only one very restrictive genre. 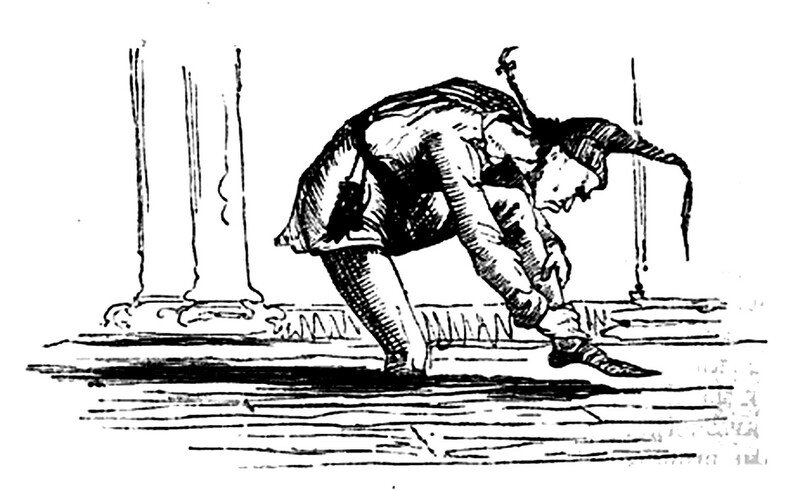 There are chess players who only open with the king's pawn, guitar players who only play the Carter lick, writers who put a topic sentence at the beginning of every paragraph, and ballroom dancers who do the same sequence of base steps and variants over and over without really listening to the music. Beginning realistic drawing students often have to struggle to get over "I know how to draw eyes" (or lips, or shoes, or hands) and learn to draw what they see rather than what they have a prefabricated pattern for. The pull of the pattern is so strong, almost inescapable, because so many of our basic life skills are just such patterns. We don't necessarily want to ride with a taxi driver who tries to take every fare from the airport to the convention center by a different route, let alone one who is constantly experimenting with new ways to turn or brake. Five hundred, or a hundred, or even fifty years ago, most people who needed to do anything with numbers only needed a few of the simple patterns (often not even all of them), and another almost-as-simple meta-pattern to tell them which pattern to deploy when. But the calculator and the computer have killed the jobs that only required simple math -- along with a vast realm of jobs that didn't require math. The minimum math your kids will need for a good job -- or just to understand what is going on in the world around them -- is much more advanced than it used to be. Once, you learned long division because it was needed by people in business to make sure they weren't selling below cost, teachers to figure grades, and electricians to balance a load. Nowadays spreadsheets and specialty software do all that -- but now the kid needs to know long division because it's one of the earliest points in math where the possibility of alternate strategies, and the need to go back, start over, and guess ahead enters into it, and those are all meta-skills that will be essential in learning the much higher level math they do need. Unfortunately, the human brain remains wired so that patterns pull just as strongly as they did back when patterns were all you needed. It takes effort to push people away from just learning those patterns and stopping there. It takes effort to push kids away from patterns in Singapore too. The drill schools there -- after school mass practice at arithmetic facts and simple algorithms -- are quite common, and really popular with parents. Quite likely, especially when they were starting out, many parents thought the only thing going on in the drill schools was the drill, and to this day, in the not very good drill schools, that is sometimes the only thing they actually do. But in the better drill schools, a long generation of emphasizing "why" in the classroom and in homework has had its effect; the drills are not just recitations of the answers, but also are attentive repetitions of the ideas behind things. The students don't just say "fourteen times fifteen is two hundred ten" or work that out on a whiteboard while mentally reciting "put them in matching columns, put down zero, carry two ..." and so on. Rather, they say something like "fifteen is one and a half times ten, so we can rearrange the problem into one and a half times fourteen times ten, half of fourteen is seven, so one and a half times fourteen is twenty-one, times ten makes two hundred ten." They might then be taken through the drill another way, reciting, "the factors are five, three, seven, and two, regroup to five times two is ten, three times seven is twenty-one, ten times twenty-one is two hundred ten." They're practicing two slightly different algorithms that quickly yield the right answer -- but they're also consciously reminding themselves of commutativity, association, distribution, and partial products while they're doing it, and they're internalizing that the right answer is always the same, but there are many different valid ways to get there, which is the essential principle behind including strategy in their number sense. The kids hate it, though. So do many teachers. Tutor manuals at drill schools have big underlined notes saying, "Do not merely repeat right answers. Recite the whole process all the way through every time." My guess is that, good for them or not, the students would really rather just be told what to do, do it, and be done. A hidden advantage of memorizing the traditional algorithms, sticking to them, and avoiding all that "why" stuff is that it's a reliable way to keep math from getting into any other part of life. Math produces insights into why things are the way they are, suggests which other ways are possible, dismisses some ideas as impossible, draws attention to perceptions about the order of things, makes the sciences accessible, and makes people smart in a way that will not work out well for people who need a population which is gullible and compliant enough to stay hoodwinked. The advantages of being really good at real math (as opposed to quick at arithmetic algorithms) is the opening up of whole new dimensions on the world. That requires the courage to allow our children in general, and your child specifically, to go beyond us, to have intellectual horizons wider and more varied than ours. Not everyone wants that: the loss of family solidarity, the collapse of the secure position of the elders being always right, the fear of eventually being judged by adult children who really do know and see more -- or of not being able to share much of a world with the grandkids after they are small -- all of these are real fears. It's the same fear people have about sending the first generation to college, or about learning to read (including the fear of having to learn to read themselves, to keep up with the kids). For that fear, all I can say is that we all know that acting from our courage is better for the kids than acting from our fears, and that it is the right thing to do. Furthermore, a family that stifles its best brains, to keep them at home, is also throwing away the possibilities you can see in what is probably the most pro-education whiskey commercial ever. Now is Singapore Math the one with the bundles of sticks, or the one with poker chips? Is Singapore Math the one where they draw circles around things? 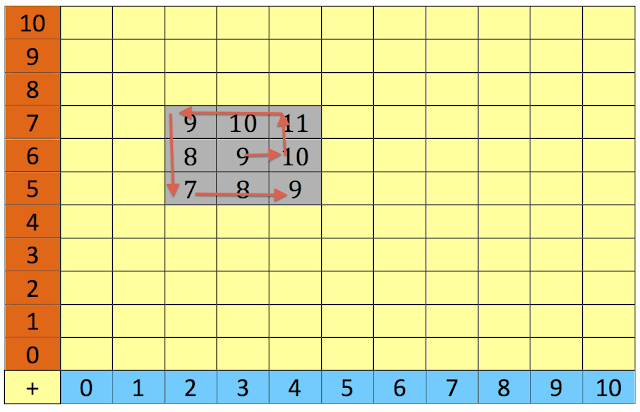 Is Singapore Math lattice multiplication or regular multiplication or something else? And of course, at that point I know I have not been communicating very well. The fault is almost certainly mine, but I offer, as a feeble defense, the sheer difficulty of shaking the grip of procedure on most people's idea of math instruction. The real answer, which I am trying to learn to give well orally, is that Singapore Math can be used to teach any procedure that works, and usually, somewhere in the world, it is. For many topics the student will learn some procedures/algorithms that are slow and cumbersome at first because it's easy to see how they work and why they always arrive at the right answer. But the thing the student is supposed to learn from that is not to divide by drawing circles and counting, or to multiply by drawing diagonal lines or laying out product matrices. What the student is learning is the why behind every algorithm: that all multiplication of numbers too large or too complicated to memorize is done by computing partial products and adding them, which works because of the distributive property. The student who understands that overall principle thoroughly will not get lost or have memory problems with whatever algorithm he or she eventually learns. That student is likely to immediately see why one multiplies for area or volume but adds for perimeter, why least common denominators are needed for adding and subtracting but not for multiplying and dividing fractions, how long division works, and eventually how factoring a polynomial is a fast way to find its roots. But to find the why, the student has to look for it, which means learning to seek it. And when a trusted adult in the student's life dismisses the why in favor of the how -- which is what "All you do is just ..." means -- and invites the kid to leave the difficult path of understanding the way up the mountain, in favor of a quick tram ride to the right answer that gets the kid off the hook, very few kids will resist that offer. When you offer "all you do is just..." to them -- or even push it on them, as I've seen some parents do -- you're turning them off the path of eventual real, deep, lasting success so that they can have the right answer on tomorrow's homework, hand it in, and forget everything. Do you really want to teach your kids to give up the richly successful but difficult long term process of really learning real math, in favor of getting done early and having more time for video games? *She wasn't exactly one of my star students in English comp, either, by the way. **I don't do it quite the way this guy does. Many roads lead to the kingdom, some of which have alternate routes, shortcuts, and interesting scenery, so the exact route tends to be highly individual, especially for one-on-one tutoring. *** Again, that's only a beginning. The next step is to note that the total number of pieces will be the denominator of the fraction times the whole number, so you multiply those two; and then that the divisor of this number of pieces will be the numerator of the original fraction; and thus arriving at the invert-and-multiply rule. Which, you then demonstrate with a slightly more complicated drawing (so you wait until they get the simple one) works for all dividends, not just whole numbers. And just to repeat the point once again, the subject here is not "how to do fraction problems" but "what is going on when you do fraction problems" -- a very different subject. **** Humble analogy (or humbling one, considering how true it is for me): I have done research for, and written specifications for, two different sets of dieter-assistance software over the years. I am also fat. It's not that I don't know it would be better for me to "eat food, mostly plants, not too much." It's that the promise of wearing a smaller shirt in a couple of months has one hell of a time competing with the certainty of a pizza tonight. One reason so many problems are hard to solve with education is the rarity of problems that are solved by knowing better. ***** In fact if you teach math, you should know the Mathemagician; lots of good things in his toybox! I've done a fair bit of science and technology journalism and understand educationese pretty well too; I'm used to explaining more-technical matters to a less-technical audience. I tutor math to elementary and middle school students for Tutoring Colorado, and I've seen how well these methods can work. Another qualification of sorts: I've spent a fair bit of time teaching ADLs, Adult Disadvantaged Learners, people in their 20s-50s who are having to painfully pick up what they never got in school. That has given me an all-too-clear picture of what the dead end of innumeracy really looks like, why it matters that just as many kids as possible get a decent start in math, and how hard it is to recover from a bad start later. I really wish I'd known many of the Singapore Math tactics when I was teaching remedial college pre-algebra and beginning college algebra! 3. the breakthrough moment when Forrest caught on to numbers as numbers, which ended with the warning note that breakthroughs are only beginnings, and that it's the practice afterwards that cements the breakthrough and makes it last. And now, about that practice. 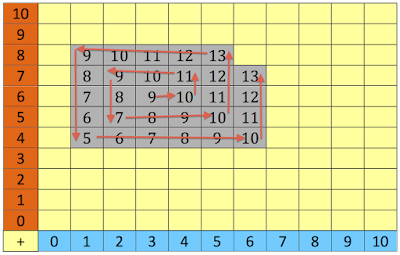 If you don't read any other post in this series, this might be the one that gives the clearest idea of what Singapore Math is all about (at least, if I understand it correctly and I'm doing my job, two things of which you must be the judge). Now that Forrest had a real idea of what numbers were, and how they connected to each other and to the world, he could see why his parents and teachers had been on his case to learn addition facts. He also had a much better understanding of what addition facts might have to do with the rest of math. All of that gave him much more motivation, but that didn't necessarily make the addition facts any easier to learn. If anything, it increased the urgency and made him impatient. Forrest's mother confirmed he was continuing his practice at home with the addition table board, and was beginning to complain that he was bored and it had become too easy. That meant it was the perfect time to introduce a more complicated trick. "Now, instead of a row, you're going to make a spiral. Watch how this works. You put the tile down to the right of the first one -- 6+4=10." I point and he does; so far, of course, this is just like doing a row. "Then we wrap around." I point to successive squares and ask him to say the sum and place the tile. "7+4=11, 7+3=10, 7+2=9, 6+2=8, 5+2=7, 5+3=8, 5+4=9 ... "
Here's what it looks like, with red arrows to show the order in which they are placed. "You see? Now next we wrap around some more, so 5+5= ..."
"Right. Do you see where we go next?" I have to correct and steer him a few times, but soon he's doing the spiral pattern correctly, and gaining speed as he goes. When it seems to be well-established, with another circuit and a half completed, I say, "So you see how it works. when you go up or to the right, the sum goes up by one. When you go down or to the left, the number goes down by one. And as you lay the tiles out in a spiral, you form that spiral pattern." "What do I do when my spiral hits the edge of the board?" "Maybe skip down to the nearest blank space?" "Or I could just start a new spiral on the board somewhere, and grow it till it runs into this one." "That would work too. Why don't you try it a couple of different ways and tell me what you think?" Long experience has taught me that boisterous kids like to make spirals run into each other, and then have some complicated rule for managing the collision. Quieter kids, especially ones who just want to get done, tend to try to figure out ways to get things back to running up and down rows and columns. After some debating, Forrest hesitantly made the boisterous choice, and started growing a new spiral around 8+8=16. "Now there's something else you need to do. Every time you turn a corner, take a long breath, and look at the tiles you've laid down. Just imagine your mind is taking a picture of it. Try that now." Pretty soon he had a rhythm going, and started building simultaneous spirals, taking turns adding to each one, so that they would collide. That small-child passion for patterns kicked in, embracing saying the addition facts as he did them. For a kid in remedial math, he seemed to be having a pretty good time. Then a moment of panic: he stumbled at "eight plus nine". He tensed up all over. "Deep breath," I said, "and look at what you already have. You've got eight plus eight on one side of it, and seven plus nine below it, and you know what they are, so the square you want has to be -- "
"Seventeen!" He was pretty excited; things were still making sense, after all. "Say the whole thing, and point. Every tile you put down, say the whole problem. If you don't know the answer automatically, use the layout of the board to see what it has to be, but once you do see it, be sure you say it." He looked a little stubborn, probably realizing how quickly he could lay out the table if he ignored all that addition stuff and just filled in the sequences. I asked him, "So what are we doing this for?" He shrugged. "It's not as boring as flash cards. It's not as hard." "All excellent reasons, but here's another one. You're training your memory to find its way to the answer. There's four things that build memories, and if you can use all of them at the same time, they make very strong memories that last for a long time. The first big memory builder is concentrating on what you're doing. Do you see that if you started just laying down the tiles in order, you wouldn't be thinking about the numbers anymore?" "You have to think about them and pay attention to them to build the memory. Pointing and saying makes you think about them a little more. It also makes you do the second thing that helps you learn: repeating a thing over and over. So ... get on with it, Forrest. You've probably almost got the whole table already, just from all the repeating and concentrating you've been doing in practice." He finished a couple more spirals, and now the board held just a scattering of spaces to fill in. "Now, this is where you can see the other two things that build memory. One is relationship." I pointed to the blank space at 9+6. "What does that one have to be?" "Exactly! Now, how many ways did you know?" He looks puzzled, which is normal at this stage, so I begin with examples. "You knew 10+6=16, you already had that on the board, right? So the 6 stays the same, the 10 goes down one, one down from 16 ... that would be one way to know. Or you knew 9+5=14, nine stays the same ..."
Slowly, he says, "six is one up from five so it's one up from 14, and that's 15." "That's right. That's another way to know." I tapped my finger over the 8 spaces surrounding 9+6. "You see? Each of these is a clue. So they're all related. This number in the middle has to be the one that all these clues fit. "That's using the third way, which is relationships, to remember. The more you relate, the better you remember. Going up, down, left, and right, it changes by 1. Going diagonal, it changes by two this way -- see, 13, then 14,15 -- and stays the same this other way. 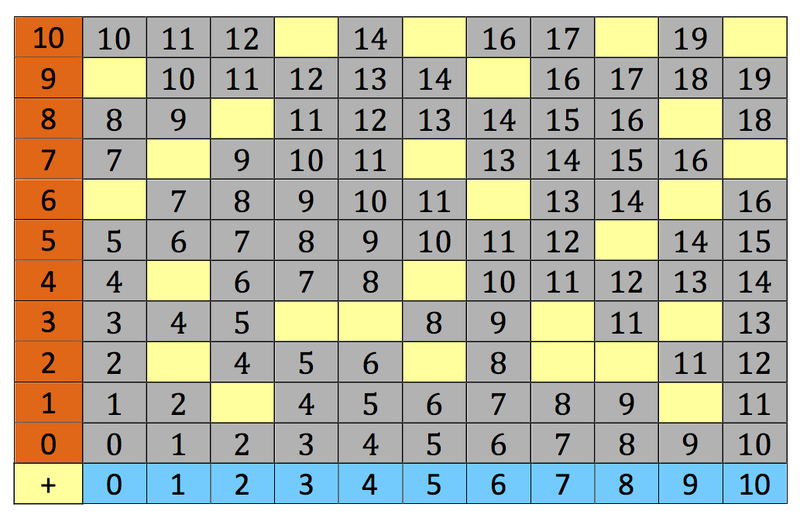 So if you get lost, not only do you have the rows and columns, you've got every square around every square." I sent him home to practice spirals, and told his mother to let me know if he seemed to be getting bored or resistant. Sure enough, by the next session, Forrest was good and bored, though he was pretty thrilled that in the special education math class he attended, he had showed a huge improvement with addition facts in a quiz that week. "Well," I said, "there are lots of other things we can use the board for, and we will, but maybe you'd like to try something else?" "Yeah!" By now, "something else" probably sounded wonderful. Attentive repetition is highly effective, but even when generously mixed with relation, it's still not much fun. "Okay, let's see how fast you can set the board up. You can do it in any order and you don't have to say them. I'll time you." He did it in less than five minutes, noticeably checking his math facts to make sure he was right. His quick confidence was very encouraging. I drew his attention to the Left-Right-Down diagonals, the ones of identical numbers. 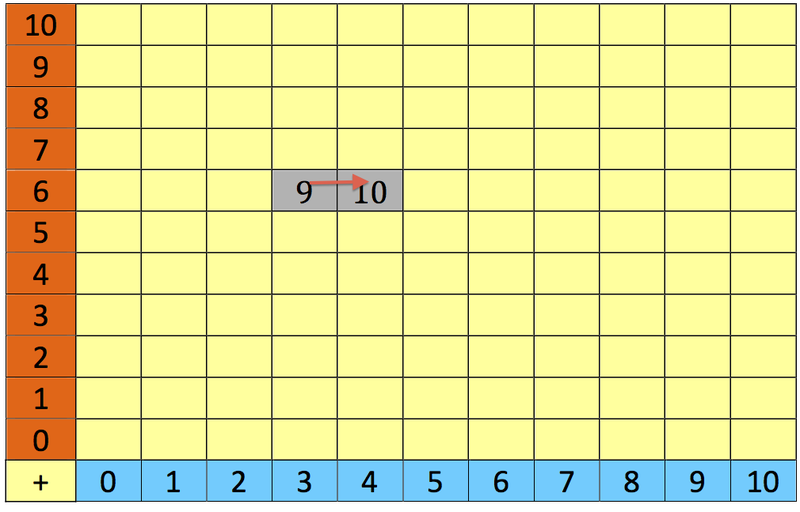 Not only did each LR diagonal contain all the same number; the only place that number occurred was on that diagonal. "All the ways of making ten are on that one diagonal," I point out. "And the only place where you find any way of making ten is on that diagonal; the diagonal is the ways to make ten and the ways to make ten are the diagonal. * Why do you suppose that is?" An advanced fourth-grader might figure out an answer, but a struggling student like Forrest first had to understand the question. (Again, no worry about that: figuring out a hard question begins with understanding it, and this was all valuable practice). His first answer was "Because it goes across like this," making a slashing motion in the air. He meant that it was a diagonal because it looked diagonal. I said he was right, apologized for my unclearness, and asked him to try again, dropping more hints each time, until it clicked and he said, "Something makes that happen." "Excellent! Now, here's what makes it happen." "Now point to the first group and say how much it is -- "
"And say 'plus,' and point to the second group -- "
"Four plus six equals ten." "Exactly right. Just like you do when you're doing the board. Now move one chip from one group to the other, and do it again." He hesitated when he ran out of one group. I pointed to the empty space where it had been and said, "So how many chips are there here?" "What's math talk for none?" "Zero. Oh! Zero plus ten equals ten!" "Good, now start back the other way." He quickly developed a rhythm, moving the counters and saying what they meant at the same time. Since he was a little bit of a ham and liked to sing, I encouraged him to sing the combinations according to a melody that he gradually made up. Once he had it well worked out, I said, "So, do you recognize the words?" "Try doing that song and pointing to numbers going down that ten diagonal on the board." He started, stopped, and looked up in confusion. "It's the same as it is with the chips. I'm singing the exact same words." "So why do the tens all fall on a diagonal?" At that point, I shut up and waited. This is one of those things where if a kid can say it for himself, you've won. "'Cause a diagonal goes one right and one down, and that's like moving a chip from one to the other, kind of." At that moment, however primitively, Forrest was doing real mathematics. Parents often ask about this. Many really don't see why a student has to know more than one way to do anything, and why that way can't just be the memorized traditional algorithm. I usually offer them this analogy: "If you are going somewhere completely unfamiliar in a town strange to you, you follow the directions exactly to get there, and the moment you get off the directions you back up, or try to figure out or find new directions. But if you are going between two familiar spots in your hometown, you have a real understanding of where they both are, and you just take what you know will be the best route between. The objective is to move your kid from that lost-in-a-strange-place, must-stay-on-the-directions state to inhabiting mathematics like it's his/her hometown." To put it a little more abstractly, once a kid learns to see the patterns as manifestations of underlying causes -- to realize, for example, that the first group can be assigned to a row and the second group to a column, and that a move that goes Row-1,Column+1 is a diagonal move on the board, and sums to zero -- that kid actually understands the math, rather than just playing the pattern. Which is to say, the kid has learned to use number sense. Not long after he started singing the groups-of-chips songs, I pointed out to Forrest that he could just picture the chips in his mind, or even imagine the diagonal on the board, and sing it just as well. I had him demonstrate it by singing the sevens diagonal while blindfolded. As soon as he finished, he insisted that his mother watch him do it. *** We agreed that he'd try to sing all the diagonals from the table a few times a day, but didn't have to use the board or the chips unless he wanted to. The next week, I handed him a randomized list of all the addition facts. In less than fifteen minutes, he had gotten them all right. When Thomas Vowler Short figured out and systematized his much better way of teaching fractions somewhere in the 1830s, he was astonished at how students went from slowly, carefully plodding to soaring. It still startles me. Breakthroughs take time and patience. Exploiting the breakthrough fully, making it part of how the student sees math and the world, takes attentive practice, so it is often a much slower process, and subject to setbacks. Keeping a kid focused on the idea while practicing is hard and requires a lot of inventiveness and close attention. Once they have learned a few fundamental ideas through the whole process, from insight to practice to complete familiarity, they really know what math is about. And after that, the kids who were "never any good at math" move with amazing speed, often moving up a full grade level in a couple of months. That blissful state doesn't last forever, of course, though it's great while it does. Sooner or later the kid faces another conceptual barrier, but the next time, it's with the experience of getting through or over a barrier, and of knowing that s/he has seen a block like this before, and made it through. The student knows to look for an idea, not a rule about where to write things, and how to practice the idea via concentration, repetition, relationship, and anticipation until it is really second nature. After two to four times working through conceptual blocks in this way, most kids are true "math kids" regardless of whatever talent they started with. They know how to push into the difficulty, how to work their way through the conceptual problems, and ultimately how to have their own breakthroughs. All that moves "Aha!" out of the realm of intuition and miracle, and into something that can be deliberately worked for and achieved. And with that power, students can go about as far as they need or want to go, without nearly as much fear or anxiety as in traditional methods. Math has become their own common sense of how the world works, rather than an arcane ritual adults use to prove you're dumb. *I don't know for sure that this will give him a head start on graphing functions in a few years, but I am inclined to think it might. **This is not usually a problem with a nine or ten year old, even one with severe math problems, but it's worth checking because now and then a child who is delayed on the Piaget scales may think that rearranging a group of objects can change how many there are. These children may grow up to become investment bankers and should be watched carefully. ***Luckily, she thought it was cute. Latecomers and accidental wanderers-in: This is one of a whole series of blog posts about Singapore Math, number sense, and how Singapore Math techniques, when properly used, build and develop number sense and ultimately gets math-blocked kids moving again. The series began with some description of what number sense is and a questionnaireto see how your number sense is; since then, we've been following a case studyof the mathematical adventures of a beginning fourth-grader named Forrest. I made up Forrest from bits and pieces of half a dozen students whom I've tutored at Tutoring Colorado, where we use Singapore Math methods to unblock the frustrated and retrieve the lost. Eventually much of this material will be in my forthcoming book, Singapore Math Figured Out for Parents. When we last left Forrest, I had finished the diagnostics and begun to assign him exercises. Diagnostics had revealed that he had a pretty severe conceptual problem: he didn't understand numbers as abstract entities in their own right, but rather as temporary names for things, so that for him, counting "1, 2, 3 ..." was really not much different from naming "Grumpy, Happy, Sneezy ..."; the count was just the last name he arrived at, and there wasn't necessarily any reason to think that if he counted the same things twice, it would come out to "Dopey" both times. As explained in the previous two pieces about him, this had also made it very difficult for him to learn elementary addition and multiplication facts, or to see any reason why the various algorithms/procedures were anything other than completely arbitrary. He'd been given an addition table board and sent home to practice with it; his mother had been shown what he needed to do and had assured me he'd be doing it. And now that you're up to date, we're ready for his next visit. Forrest's mother had assured me that he'd been practicing regularly, with occasional minor nagging and reminding from her. He was also complaining that the addition table board was getting dull, and had mentioned that I had promised him that eventually we'd be playing some games on it. So far, for Forrest, math tutoring was occasionally different, but it still bore an uncomfortable resemblance to plain old math. He found this mildly interesting. I added, "I'm holding the tiles over here in this rack -- it's the same one we'll use later when we're playing games -- so that you can't see them. What you have to do is point to a square and ask me for the tile that goes there -- by number, you can't just say 'May I have this tile.' Ready to try?" He nods, points to an easy one, 3+4, and says, "I need a 7 for this one." I give it to him. He quickly realizes that he can do this -- the location of most of the blanks at intersections of sequences makes it very easy -- and picks up speed and confidence. When he has most of them, has made no use of his fingers, and is going very quickly, I throw him a little bit of a curve. He points to the 5+8 box and asks for a 13. I ask him, "So is it true that 5+8=13?" He starts to count; I say, "Whoa. You did that problem already, several times, this past week, right? And you just pointed to it." "But you just asked me again." "I asked you if it was true." "Well, I don't know if I counted right." "It is true, Forrest. It will be true whether you count it or not, it was true before there was anyone to count, it will be true forever, even if we never put the tile on the board or we take it off and put a wrong number in its place." "Okay." He sounds very doubtful and looks confused. Nonetheless, it's a healthy confusion. I push him a little more. "If you have five Pokemon cards and I give you eight, how many do you have?" He starts to look at his fingers. I hand him the tile he asked for, and he puts it down, almost unconsciously. "Look at the board." I point to the five. "Say after me. 'I have five Pokemon cards, I get eight more, and now I have ...'"
He's been mumbling along, but now, firmly, he says, "Thirteen Pokemon cards." "Because -- " I point back to the five. "Five plus ... " I point again. Suddenly he's pointing, as he's been practicing all week, but with much more enthusiasm. "Five plus eight equals thirteen!" "Right. Now let's do it with dollars." We do dollars in a bank account, books on a shelf, and at his suggestion, zombies in the graveyard, and at my suggestion, tyrannosaurs on Mars, even though there aren't any really. Each time he finishes with "because five plus eight equals thirteen." It's time to see if he sees the point. "So, five anything plus eight anything makes -- "
"So when you are doing a problem fifty years from now, and you're an old guy like me, no matter what you are adding, if it's five and eight -- "
"And way in the future, when you're counting up something that hasn't even been invented or discovered yet, if there are five of it in one bunch and eight in the other bunch -- "
"Thirteen." He looks a little astonished and even, still, a bit confused. "What if there was a group of eight dinosaurs and a group of nine tyrannosaurs on Mars?" His hands start to come up to count, but he stops himself before I can, and silently points for a moment before he says, "There would be seventeen tyrannosaurs on Mars." "For sure!" He's looking at the whole table now, as if it were a pirate's treasure map or the secret pathway to Oz or Middle Earth. I suppose in a way it is. I wouldn't be able to explain it to him, but he's just taken that step into abstraction, and found out that numbers are not arbitrary. He may not ever like it, but at least he knows a little more of what he's dealing with. Nice king you got there. You want him asking about the baby? Rumplestilstkin tells the former-millers-daughter-now-queen that he will cease tormenting her if she can learn his name. "Are you called Rumpelstiltskin !" The groundskeeper still talks about what a job cleaning up that was. that he could not draw it out again. Then he took hold of his left leg with both his hands, and pulled away so hard that his right came off in the struggle, and he hopped away howling terribly. And from that day to this the Queen has heard no more of her troublesome visitor. In half or more of the Hollywood movies about mental illness you've seen, that's the ending; the clever therapist (or the clever patient, or someone clever) figures out the one thing causing all the patient's problems (Rumpelstiltskin, abuse, some traumatic event), and as soon as it is named, the patient's problems vanish, leaving the patient all better. Freud seems to have started the whole genre of "Rumpelstiltskin cures" with his paper about the Wolf Man, whose problems supposedly originated from having walked in on his parents at That Awkward Moment. Even in the much less upsetting realm of math difficulty, Rumpelstiltskin is not how it works. Just naming the problem is handy, but it's not even close to the solution. Conceptual breakthroughs are often very important, but they are the beginning, not the end, of the process. Forrest still had to learn all the math he hadn't learned before, and re-think all the math he thought he knew, and practice until the correct concepts became the center of how he knew that math. Going back, seeing the first wrong turn in the road, and correcting that turn, still leaves you with a lot of driving to do. And driving, in this case, was a metaphor for "practice." The next and final part of the story is less dramatic (no mystery to it) but it's where Forrest did the real work of Singapore Math and finally caught up with his classmates. The genius of Singapore Math is that it teaches the student to think about the right concept at every moment of practice; it's never just a procedure, it's a procedure and the idea behind it. Forrest had seen what the right idea was, after years of living with the wrong one. But for the right ideas to fully displace the wrong, so that he was forever on the right track, he'd have to practice, practice, and practice, and it would have to be the right kind of practice, by which I mean the Singapore Math kind. That's the real finish of the story, when the most important parts happen, and I'll tell you about that tomorrow.